Mastering a baitcaster takes hours upon hours of practice, and we are not setting out with this article thinking we can make you a master in a few minutes of reading this. We do hope that we can provide the basics of using a baitcaster and perhaps cover some information or tips that will aid you along your journey. The baitcaster was designed to give anglers the ability to use heavy line and heavier lures. The design of these reels allows tremendous accuracy and distance on the cast. The baitcaster sits on top of the rod with the spool sitting perpendicular to the length of the rod. This design allows line to come off in line with the rod which helps its casting. This design also improves the gearing and drag efficiency of these reels in relation to the spool. There are two types of reels that fall into the baitcaster category. The first is a traditional round model that can hold a tremendous amount of line and generate a lot of power. This type of reel can be cumbersome to handle for long periods of time for most anglers. The second style is the low profile baitcaster which sits low on the rod and is extremely easy to handle and use for lots of casting and retrieving. Both styles provide a design that allows the angler to generally better leverage on fish and give a lot of cranking power. There are some basic parts of a baitcaster that you should be familiar with. You have the frame and side plates with the spool positioned within this frame. In front of the spool is a level wind which is an aperture that the line passes through. When casting and retrieving, the level wind glides back and forth along the width of the spool to lay line back down evenly. You have your reel handle which is often a double arm model. The drag adjustment is often a star drag that sits adjacent to the handle in between it and the side plate of the reel. You also have the thumb clutch which sits behind the spool at the back of the reel closest to you. Pressing the thumb clutch disengages the spool and allows you to make the cast. You also have a brake system which puts pressure on the spool during a cast to help reduce backlash. The brake adjustment is located on the opposite side plate of the handle and is an external dial with magnetic systems. With some models that use a centrifugal brake, the adjustment sits beneath the side plate which must be removed to adjust the brake pressure. You will also have a spool tension adjustment knob located on the opposite side of the handle as well. Casting a baitcaster proficiently takes a little bit of time and experience. Unlike a spinning reel, the spool of the baitcaster rotates freely on the cast. This helps casting distance but it can also be problematic in windy conditions and when the lure hits the water. The mechanics and motion of the cast with a baitcaster is the same as any other rod and reel, but the intricacies that go into working the spool differs pretty dramatically. Baitcasters were designed to use heavier line and doing so makes casting much easier. Light line on the spinning spool is a good way to get some nasty backlashes. Wind also can be a hinderance, especially if you are using light lures as the speed of the spool is greater than the speed of the lure which causes line to bunch up in the spool and give you the classic birdnest. 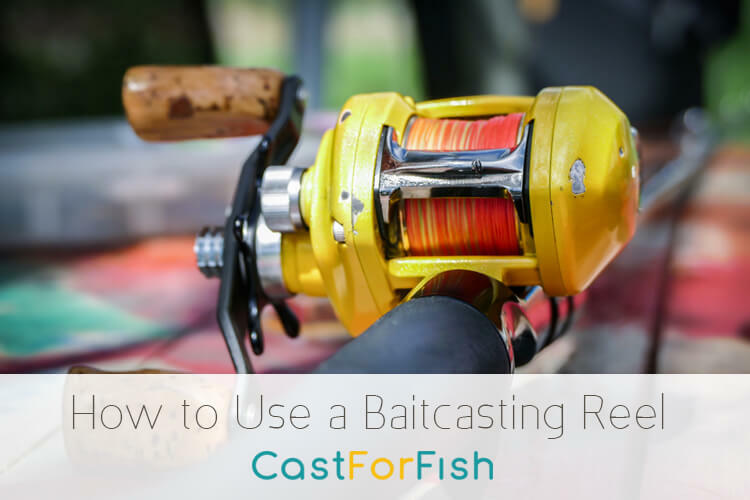 When beginning your cast, the reel should be sitting comfortably in the palm of your hand with your thumb having full access over the top of the reel. To disengage the spool, simply press the clutch down with your thumb while keeping part of the thumb lightly placed on the top of the spool to keep line from leaving due to the weight of the lure. Go about with a normal overhead cast and at your release point reduce the amount of pressure on the spool with your thumb to allow line to leave. You want to keep a decent amount of pressure on the spool with your thumb. Even though the brake system keeps some pressure on, nothing beats manual thumb control of the spool. As the lure reaches the water’s surface, you want to tighten down the pressure with your thumb. The spool tension is often the part of the casting system on a baitcaster that is not utilized properly. It is not to be confused with the brake system and shouldn’t be used as such unless you want the gearing around the spool to wear quicker. The spool tension is an actual force on the spool and is used to calibrate the spool to the size of the lure. Turn the brake fully off when changing lures that differ pretty dramatically in weight. Disengage the spool and tighten or loosen the spool tension until the lure falls slowly to the ground. With the spool calibrated properly for the lure weight, backlashes are less common, and casting is much smoother. Braking systems on baitcasters often come as a centrifugal (friction) or magnetic mechanism to place resistance to the spool spin throughout the case. Though the brake system greatly reduces the amount of backlash, do not rely solely on the brake system. Your thumb is the best control you have over spool speed. The brake system can be adjusted to provide more or less resistance to the spool and the amount you need all depends on the conditions and lure weight. Less brake is required with heavier lures. More brake is often needed with lighter lures and in windy conditions to keep the spool from outrunning the lure. Baitcasters offer tremendous performance to the angler and opens the doors to a lot of new fishing opportunities. It does take some time to get to the skill level where you can use the baitcaster effectively, but once you’re there, it’s hard to ever put one down again. Want to learn how to use a baitcasting reel? This guide gives a great overview on everything you should know about using baitcasters.